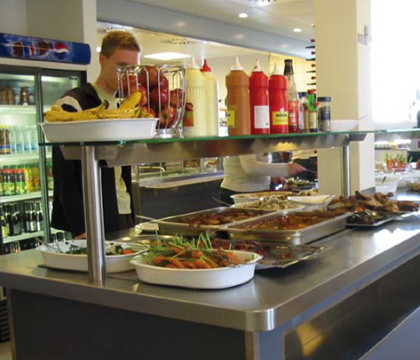 Review: Canteens on Campus _ Mathias Vestergaard Corp.
During my first year of studying (and ever since, actually) I’ve spent a lot of time having lunch with my study group. However, we never just had lunch. During the meal discussions always revolved around the quality of the food and the atmosphere. We tried different canteens on campus and compared results, and in the September 2006 issue of Delfinen (#126) we wrote a comparative review. The review sparked some controvercy: a week after it was published my editor at Delfinen received a two page letter from the Dean, complaining that our review had errors of fact and that we were destroying the working environment for the employees. The review is written by Kasper Schiølin, Janus Novak Olesen, Lasse Damgaard and Mathias Vestergaard. Photos by Lasse Damgard. This entry was filed under Delfinen, Food, Reviews.